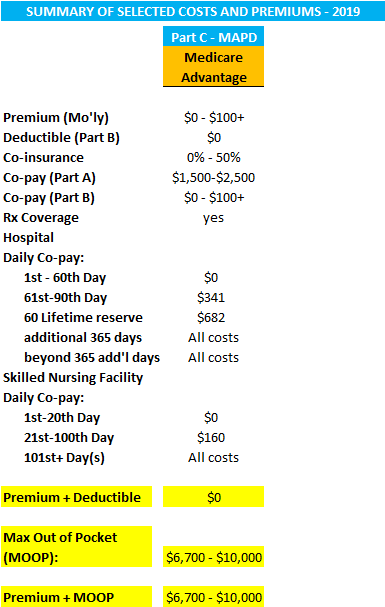 Premiums vary as do deductibles, co-pays and co-insurance on certain benefits. Plan premiums are $0 on some plans. These Medicare approved plans must provide at least the same coverage on an actuarial basis as Original Medicare, (Medicare Part A - hospitalization and Medicare Part B - medical). The plans have networks of doctors, hospitals, rehabilitation facilities and clinics. Typically you select a network doctor to be your Primary Care Provider to manage your care. Unlike Original Medicare, each plan has a Maximum Out Of Pocket limit and may offer some additional benefits like vision, hearing, dental and/or fitness facility. Some plans include prescription drug plans (MAPD). Otherwise prescription drug coverage can be obtained through a separate PDP (Medicare Part D prescription drug plan).